Demi-permanent Color is ammonia free coloring PBF but come here that satisfies the most frequent color requests and interprets the trendiest fashion effects. 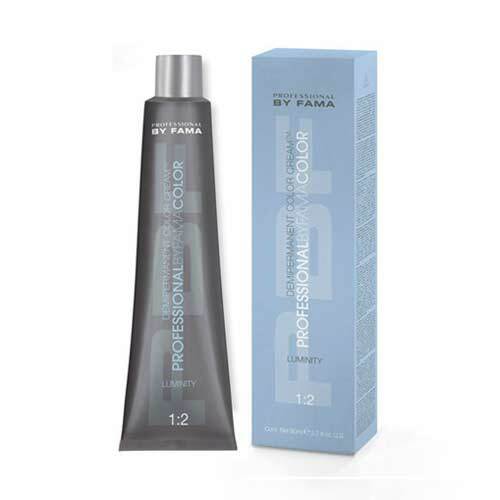 Gives hair a color iperbrillante and regenerates them thanks to its technological formulation based on the fusion of two innovative active ingredients, the Texture and the Re-Luminescina Complex. Also covers white hair naturally, without lightening the base. Its texture is soft and fluid cream, easy application, allows to reduce time of service; the base contains oleic complex PEG-TH that, acting for absorption, guarantees a uniform result even on hair with cuticular structures and levels of color; its pigments from the balanced molecular weight are ideal for direct applications on bleached: This means ever more repigmentation. The LUMINESCINA is a patented ingredient of new generation can absorb UV radiation and turn them into a new light source, which is thrown directly onto the hair, increasing the brightness. The Luminescina you get from mullein, flower petals plant present in the whole Mediterranean area. In addition, in vitro tests show that Luminescina acts as a potent antagonist of photo-oxidative stress, countering free radicals. The RE-TEXTURE COMPLEX is a molecule derived from silk and covers the entire surface of the hair colored with a silky and tough film that gives the hair a soft and smooth. Also fixed inside color pigments, maintaining its intensity. colours: natural, 8 5 20 shades of which: warm beige, Brown and beige 5 cold 2 to respond perfectly to the needs of brown hair and blonde hair. packaging: tube of 80 ml.